China’s Belt and Road: Where Does the Arctic Angle Stand? Beijing has had an active few months of Arctic diplomacy. The paper highlights “3 sea routes planned for Belt & Road Initiative,” with the Arctic Ocean named in the same instance as such globally critical trade routes as the Suez Canal and the Pacific Ocean. The Arctic region is emerging as a new global trade route, which is already the case by air, while sea and land transportation are emerging. Concrete steps towards economic development are taking place in the Arctic, and China’s engagement has been an important driver for many significant Arctic projects. China’s engagement with Arctic partners showcases the region’s increased global importance. Last April, following a meeting with the President of the United States Donald Trump, at Mar-a-Lago, Florida, China’s President Xi Jiping, made a surprise visit to Alaska on his way back to China and discussed Arctic-related topics with Alaska’s Governor Bill Walker, including liquefied natural gas resources in Alaska and trade. China has become Alaska’s largest trade export market, with goods including seafood, minerals, oil and other products sold for for close to $1.2 billion in 2016. Earlier, on his way to the United States, Xi made an official visit to Finland, the country that currently holds the Arctic Chairmanship for a two-year period before passing the torch to Iceland in 2019. Arctic issues and economic cooperation, including the Belt and Road Initiative, were high on the agenda during the visit. Further discussions on the Arctic issues and Nordic participation in the Belt and Road initiative have followed during prime minister visits from Norway and Denmark to China, as well during ministerial-level visits to Iceland and other Nordic countries. At the international Belt and Road Forum in Beijing last May, the Minister of Transport of Finland Anne Berner, was one of few Nordic minister-level participants, and Nordic infrastructure projects such as the Arctic Corridor have obvious synergies with the Belt and Road Initiative. The Vice Premier of China Wang Yang furthermore highlighted China’s increased Arctic contribution at the 4th International Arctic Forum in Arkhangelsk, Russia, last March. The discussion is taking place on broad level, as was noticeable during the end of May when the China-Nordic Arctic Research Center (CNARC) held its 5th annual China-Nordic Arctic Cooperation Symposium in the port city of Dalian, with the Belt and Road initiative as a key topic, touched upon by leading policy-makers, industry representatives and scholars. Furthermore, an economic roundtable on Arctic Shipping and Port Cities took place under the CNARC roundtable code. Amongst the symposium speakers were Lin Shanqing, Vice Administrator of the SOA and former President of Iceland (1996-2016), Olafur Ragnar Grimsson, who is chairman of the Arctic Circle that will host its 5th Assembly in Reykjavik October 13-15 where discussions on the Belt and Road Initiative and the Arctic will continue. These topics also played a role in the 7th Sino-Nordic (Think Tank) Roundtable in Oslo earlier this month. The Nordic Council of Ministers’ and the Chinese Ministry of Foreign Affairs furthermore highlighted synergies in a joint press release last May. One of the Belt and Road Initiative’s five core pillars is policy coordination, and recent examples showcase that policy is being put into action by China. Tangible developments have followed the Arctic’s increased policy importance for China, and the world’s largest trader is already leading the way in Arctic shipping. 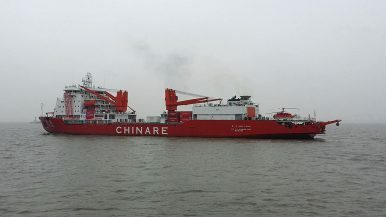 The 8th Chinese National Arctic Research Expedition (CHINARE8) by the icebreaker R/V Xuelong (Snow Dragon) is currently underway and the vessel has now completed its Arctic rim expedition through the Central Arctic Route and the Northwest Passage by Canada. Having already transited the Northern Sea Route in Xuelong’s historical CHINARE5 voyage in 2012 to Iceland, when it became the first Chinese-flagged vessel to transit the Arctic Ocean. Xuelong has now become the first vessel to transit all three Arctic sea lanes and Chinese companies have followed. China COSCO Shipping has established itself as a leading Arctic shipping company in the Northern Sea Route and this year a record number of at least six Chinese-flagged commercial vessel make use of the shortcut to Europe. The Northern Sea Route also had a boost earlier this year with a record breaking voyage by Sovcomflot’s liquid natural gas carrier Christophe de Margerie, transited the seaway in six and a half day without icebreaker assistance from Norway to South Korea. Port investments can follow in the Arctic, and the Chinese Poly Group has signed an agreement of intent for port development close to Arkhangelsk. With Chinese overseas port investments reaching $20 billion last year, investments to other Arctic ports could follow. There are however voices of concern for China’s increased Arctic engagement, most noticeably voiced in a Center for Naval Analysis and Solutions (CNA) report released last month, titled “Unconstrained Foreign Direct Investments: An Emerging Challenge to Arctic Security”. The Maritime Executive introduced the report with the attention-grabbing headline “Unconstrained Chinese Investment in the Arctic Questioned”, stating that Chinese investments in the Arctic region (which has a broad definition of 60 degrees North and above in the report) have reached $90 billion already. Taking a closer look at the CNA report the figures do not add up, with Iceland said accounting for $1 billion in Chinese investment and Greenland a staggering $4 billion between the years 2012-2016. The figure in Iceland might be closer to 1/20 of what the report claims and in Greenland it is even further off, with large-scale projects such as the Issua iron ore mine not having come to fruition. It is however true that China has increased its economic and scientific engagement in the Arctic. It would be a great boost for the Arctic region if interested parties, including from the United States, would play a significant role in Arctic investments. There are mutual benefits to be created between local Arctic stakeholders and international partners built on initiatives such as the Arctic Investment Protocol and the work of the Arctic Economic Council. Creating synergies should be the goal, rather than attempts to deconstruct those who are driven by value-creating incentives in cooperation with local Arctic stakeholders. With an estimated $1 trillion investment potential in the Arctic the next 15 years, there should be plenty of room for a diverse array of international investors entering into projects in the world’s last emerging market. Heidar Gudjonsson is Chairman of Eykon Energy, Vodafone Iceland and the Icelandic Arctic Chamber of Commerce. Egill Thor Nielsson is Executive Secretary of the China-Nordic Arctic Research Center and Visiting Scholar at the Polar Research Institute of China. The opinions expressed here are their own. The Arctic states could find much-needed funding for infrastructure improvements through China's Belt and Road. Why the Civil Nuclear Trap Is Part and Parcel of the Belt and Road StrategyXi’s One Belt One Road: A Plan Too Big to Fail?Is China’s Belt and Road Initiative Increasing Crime and Terrorism?Rise of the Redback: Internationalizing the Chinese RenminbiWho Benefits From China’s Belt and Road in the Arctic?